Drinking good Sauternes can be moving. Is it because of its great power of expression, its luscious sweetness, its fathomless depth? Or is it because I hardly ever drink Sauternes on a 'normal' day? In a way Sauternes appears like a Harp does in a concert: at the highlight. In an attempt to have a great evening last forever, we return to our cellar to dive up one of our golden treasures. Nine out of ten bottles are enjoyed within this best possible environment: among friends, who are all reluctant to call it a day. Most bottles that I enjoy are lonely bottles. For example one to wrap up the evening, or one as the very last bottle of a tasting. It's not a deliberate thing, but I am not drinking Sauternes every week, or every month... but after the tasting of last weekend I know that I will shift my attention – again – to this great classic region. If only it were to experiment with new wine-food pairings; there are so many more possibilities than the obliged combination with cheese for desert. 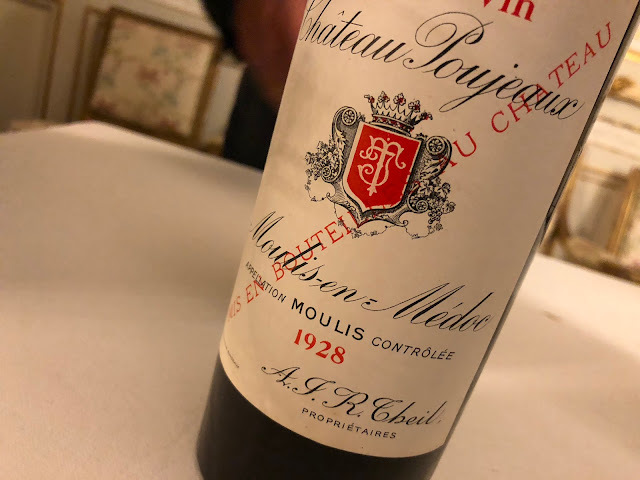 Just to mention one of the inspiring things that were told during this afternoon – I do not remember if it was one of the château owners who said this, or Sauternes connoisseur Bill Blatch, who introduced the producers at this tasting. BORDEAUX WINE MERCHANT BILL BLATCH (VINTEX). BLATCH IS SPECIALISED IN THE WINES FROM SAUTERNES, AND IS GENERALLY REGARDED AS ONE OF THE AUTHORITIES ON THIS SUBJECT. FROM LEFT TO RIGHT: PHILIPPE BALY FROM CHATEAU COUTET, EDWIN VOS FROM POOT AGENTUREN, TON OVERMARS, CAROLINE DEDIEU FROM CHATEAU SUDUIRAUT AND BERENICE LURTON-THOMAS FROM CHATEAU CLIMENS. UNFORTUNATELY MISSING ON THESE PICTURES IS LAURE PLANTY FROM CHATEAU GUIRAUD. The appellation Barsac lies directly north of Sauternes, at the other side of the small river Ciron, on lower grounds close to the river Garonne. The sediments that have been deposited onto the limestone subsoil – throughout the many many thousands of years – have here been largely taken away again by the river. Other than in Sauternes, where the limestone lies deeper, and where the vines grow on hills with gravel and pebbles. This accounts for a difference in the style of the wines. Barsac (which may also be called Sauternes or Barsac-Sauternes) produces wines that are slightly lighter than Sauternes. After decades of misery in Sauternes (for a long time there was hardly any interest in the wines from this region, which understandably didn't have a positive effect on the quality of most wines) it is good to see that the region is fully back on track. The overall quality of the wines is high. My personal favourite is Clos Haut-Peyraguey, all three years of this wine are very good. It is just too bad that they just replaced their very characteristic label for a mediocre modern one. The old label of Clos Haut-Peyraguey has this convincing, forward and original typeface. Too bad, but well, what matters is what's behind the label. THE TALENTED CELLAR MASTER ANTHONY DEFIVES WHO WORKS FOR MARTINE LANGLAIS-PAULY FROM CHATEAU CLOS HAUT-PEYRAGUEY. All 2005s are really great; very rich with sometimes high amounts of residual sugar (e.g. Climens with 170 grams per litre, and a very impressive wine...). The 2005 vintage showed both wines of an outstanding quality, and the yields were much bigger than in 'normal' years. 2002 is a good vintage, more modest in character, often spicy. Especially Suduiraut gives a lot of pleasure. Within the 1998s and 1999s there is more variety in quality, with the best results it seems from the higher grounds. Your view of the 2007 versus the 2009 vintages in terms of Botrytis content and secondly your opionon on the development of the 2001 vintage. Comments on the 2001 Lafaurie Peraguey are welcome. David: The Overmars Sauternes tasting was a lot of fun, wasn't it? I really appreciated your enthusiasm too. We must do another one! I really agree about the 98s, 02s etc, and the 05s were - and still are - looking fabulous.